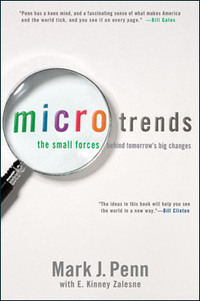 Microtrends: The Small Forces Behind Tomorrow's Big Changes (Mark J. Penn with E. Kinney Zalesne, Twelve, 2007, 448 pages) is a collection of 75 microtrends Penn claims to have discerned from poll research. Penn defines a microtrend as an intense identity group that makes up one percent or more of the population and is growing. Without offering any evidence, Penn claims that such a group can have significant impact on society. Although I have two problems with the premise of this book, I do think it can be useful to business leaders and to marketers. First, my problems, and then a few ways you might use this book. I seek evidence for any assertion made by an author, unless (as in The Black Swan: The Impact of the Highly Improbable ) the author is clear that the book is essay, philosophy or opinion. Penn offers little evidence for any of his assertions. That's my first problem with his book. The second problem is my belief that any meaningful societal changes are going to be likely to surprise us. Beyond the next few months, Penn's predictions are as likely to be false as true. Given that, I offer one caveat. Do not hitch your wagon to any single one of these microtrends. If you want to maximize your chances of success, find many of these microtrends to exploit, each in a relatively small way. As some microtrends die, drop your initiatives in those areas. As others surface, start new initiatives. Don't bet your company or career on a single "maybe." "Office Romancers" - 60 percent of employees in one survey reported having been involved in an office romance in 2006, and that number is increasing. Many are getting married to office-mates. Have your HR policies and procedures kept pace? Are your policies friendly toward co-working spouses, or are you driving them to work for the competition. "Working Retired" - Americans love to work, and are likely to retire later and later in life. That means you might not be facing as big a worker shortage as you think. And it means that your younger workers may be frustrated because we older folks just never seem to leave and open up the plumb positions. Have your policies kept up with this change? How will you retain the older workers you need while attracting the young folks you also need? "Stay-at-home Workers" - More people want to work on their own from home. Stay at home workers enjoy the flexibility and control they have and not having to commute. And studies apparently show they are more productive than in-office workers. And because they don't commute, they are good for the environment. And you don't need as much office space if some or many of your workers tele-commute. How will you support this trend? How will you help telecommuters build community? How will you evaluate and promote stay-at-homers? "30-Winkers" - Americans are not getting enough sleep. Among many things, this can mean lower productivity. How can you help your employees with this problem? Have you considered nap rooms? Or buying a few of the sleep pods visible in some of our airports? Perhaps not new is the thought that the latest generation of workers expects unlimited choice. How will you micro-target each new employee in order to keep them with you for as long as you want? *Most of Penn's microtrends are relevant for the US, although he includes notes for elsewhere.